Happy Groundhog Day | Happy Powder! While Punxsutawney Phil has predicted an early spring for 2019, we think he's wrong this year! - High alpine base: 77"
It's not too late to fit in a great ski vacation this season! Conditions are fantastic, Stay Montana has great lodging options available, and there are more flights than ever now coming to Bozeman Yellowstone International Airport. If you live in Montana, it's only a few hours' drive to experience epic ski conditions. Big Sky Resort recently announced the return of the April Pass, featuring 21 days of spring skiing for $221. Information is available at aprilpass.com. Must be purchased before Feb 11, so don't delay! Additionally, Big Sky Big Grass - bluegrass festival - has moved to April 11-13 this year. Magnificent music combined with spring skiing makes for great memories. The New Year is off to a great start in Big Sky and Bozeman as the skies have blessed us once again with huge snowfalls. Big Sky Resort has a 30-35" base at lower and mid mountain, with a 53" base on the upper mountain. Bridger Bowl has had 124 inches of snow. Are you searching for your ski gear yet? Pack soon and book a direct or easy connection flight to Bozeman Yellowstone International Airport. Then start your search for lodging with us at Stay Montana! We have several new properties now added to our collection of vacation homes - we're sure you will enjoy spending a ski vacation with us. Check out our homes at Stay Montana Vacation Rentals. Be sure to check out the new RamCharger8 lift at Big Sky Resort - it is awesome and can't be missed! Congratulations to our office suite mate Dave Pecunies, voted 2018 Best of Big Sky: Best Artist/Photographer! Please stop in the office & gallery to check out some of Dave's terrific images and take home a souvenir that captures your experience in Big Sky and the surrounding region. The owners and partners of Stay Montana, along with Dave Pecunies Media, celebrated the Chamber ribbon cutting for our new Big Sky Town Center office & Dave's photo art gallery. We are excited to announce the Grand Opening of our Big Sky office located at 33 Lone Peak Dr., Suite #104 in Big Sky Town Center. On Nov 24th - Small Business Saturday - Big Sky Chamber and the Stay Montana team will conduct the official ribbon cutting at 12:30 p.m. The public is invited and refreshments will be served. Stay Montana is also offering great discounts to area residents on all our vacation rental properties for stays between Nov 24th to Dec 20!! Offer applies to Montana residents only. Use promo code 'Lastbestplace'. This offer is a great way to experience some of our vacation properties and enjoy the area's activities prior to the holidays. Why not stay the weekend and enjoy the Big Sky Christmas Stroll? We hope to see you soon! 20 Days Until Big Sky Resort Opening Day - Happy Thanksgiving! Be sure to join the early season festivities to get into the full swing of the holidays. Find the perfect lodging location on staymontana.com, and create the most enjoyable holiday memories to last a lifetime. Your Montana starts here! Dec 7 – Big Sky Christmas Stroll - Visit us at our Stay Montana Big Sky Town Center location for some holiday cheer! At Stay Montana, we have a great selection of accommodations to fit your family, so why not bundle up and head to Big Sky this holiday season? Make your plans, book your reservations, and start packing now! We hope you are as excited as we are for the kick-off of another wonderful winter season, and we hope to see you soon! Stay Montana is now headquartered in Big Sky Town Center, with expanded space for our staff and guest services. Recently moving from our previous location in Meadow Village Center, Stay Montana has grown to better serve our vacation home owners and visiting guests in the resort community. We are a full service vacation rental management company with offices in Big Sky and Bozeman. We believe vacation home rental is a hospitality business, and we have created a trained and experienced team focused on exemplary guest and property owner experience. Our service first philosophy is a proven model that we've used for decades in our owned and managed vacation homes, and we now offer this approach to Big Sky, Bozeman, and greater Gallatin Valley owners and guests. Please stop by to visit with us in our newest location: 33 Lone Peak Drive, Suite #104, Market Place Building, Big Sky Town Center. Stay Montana has partnered with an experienced and emerging Big Sky photographer - David Pecunies - showcasing his amazing photographic works of art in our shared office space and gallery. To find out more about David and his work, visit his website at www.davepecunies.com. We know how difficult it is to capture the vistas of Montana on our mobile devices, so please visit our gallery offices today and take home a memory of your Montana experience. Your Montana Starts Here! Easily accessible from Hwy 64, Lone Mountain Trail, we look forward to seeing you in our new space in Big Sky Town Center. General office hours are Monday through Friday from 10:00 AM to 6:00 PM or by appointment. Hours may vary on a seasonal basis. Easing into autumn on the last summer weekend of 2018, there was much excitement in the cooling mountain air. The last summer concert was held in Big Sky Town Center, and adventure runners are taking on one of the all time challenges in The Rut race events this weekend. It is fun to visit with friends old and new as we celebrate Labor Day in Big Sky, Montana. Visiting Montana this fall? Be sure to check out the selection of vacation homes for your family reunion or gathering of friends. Pulling together the group for MSU Homecoming weekend Oct 12-13, 2018? Each fall MSU alumni from across the country travel home to Bozeman to see friends, celebrate the blue & gold traditions, and cheer on their beloved Bobcats. Wouldn't it be fun to celebrate in a comfortable vacation home to give you maximum flexibility for your weekend of festivities? For MSU event details click here. Check out this article on Vogue.com highlighting our wonderful landscape and favorite destination areas of our region. We are happy to call this place home, and look forward to hosting you at Stay Montana as you create your own Montana adventure. Your Montana Starts Here! [August 2018] At Stay Montana we are soaking up each and every sunny day! And with several weeks left of Montana summer - which extends well into September - this would be a great time to book an end of summer vacation and create your own memorable adventure. We are sharing some of our summer 2018 photos with you and hope you enjoy them. Summer blends into autumn here in the mountains, and with the kids back in school, this is a great time to plan a getaway just for you! Enjoy fall savings on Stay Montana lodging - call us for details. Your Montana starts here - what is in your Montana story? [July 2018] Summer kicks into full swing with 4th of July celebrations along with an extensive line up of entertainment and events to keep us having fun through Labor Day and beyond! Summertime in Montana is spectacular, and we can’t wait to share some of the sunny days and good times with our friends and guests this year. With numerous daily direct flights to Yellowstone Bozeman International Airport, you can get here quickly, so pack a bag and escape to the mountains. There is still plenty of summer left! A summer's 'Day in the Life' of a Big Sky/Bozeman resident or traveler always includes great hikes, invigorating mountain bike rides, and horseback riding on our hundreds of miles of trails. You will also find us fishing, floating, or rafting on our pristine blue ribbon streams. A visit to Yellowstone National Park is on every traveler's bucket list, and locals alike enjoy regular journeys into the park, as there is always something new and exciting to discover! There are so many ways to experience our great outdoors. Additionally, you can round out your Montana vacation with some of the other great activities and events featured below. The golf course in Big Sky has some of the best views in the country, and their online booking system makes it easy to schedule tee times in advance of your visit. Be sure to play a round while you are here! In Bozeman, Bridger Creek and Cottonwood Hills offer public access as well. Bridger Creek has an 18 hole course, driving range, and Rocky Mountain Golf Academy - a premier short game practice facility. Cottonwood has an 18 hole course and an executive par 3 course. Great for a quick game, or fun with the kids! We love music under the stars and our outdoor concerts do not disappoint! Bring family, friends, a picnic blanket, and experience every genre of music for a delightful summer outing in Big Sky country. FANTASTIC SUNSETS - Don't miss our awesome sunsets! The image below was captured by Dave Pecunies of Big Sky. Be sure to stop by our new main office location in Big Sky Town Center on Lone Peak Drive. We are pleased to share our office space with Dave for his new photo gallery. Take home a souvenir for your wall to remind you of your wonderful time in Montana. We hope to see you soon!! Stay Montana Big Sky office - 33 Lone Peak Drive, Suite #104, Big Sky Town Center. We are putting the final touches on our new office space. Please stop in and say 'hello' when you're in the area! [05.22.18] Summer Solstice - it will soon be here - the longest day of the year and the first official day of summer. With early sunrises and late sunsets, make the most of every moment of these extended days in Big Sky country! There are many ways to celebrate and usher in this special time of the year, and Stay Montana is offering a special incentive for bookings at some of our properties through June 21, so don’t miss this great opportunity to enjoy more of southwest Montana! [get details here]. A very dear departed friend used to love summer solstice, as he would then start counting the days to ski season!! And while we here in Big Sky & Bozeman are in the midst of diehard snow sports country - make no mistake - WE LOVE SUMMER!!! We wanted to share the blossoming of this magical season with some summer inspiration below. But don’t just read about it - pack your bags and get on out here! There’s nothing like experiencing our mountain air, pristine rivers, and glorious vistas in person. This notorious day trip is not to be missed. Roundtrip from Bozeman to Red Lodge over the Beartooth Pass to Cooke City and home through Yellowstone National Park. [or the reverse] Route details and more information here. Big Sky Resort is ready - Summer Opening Day is June 8. Mountain Biking Opening Day is June 23, weather permitting. The Big Sky golf course is open now. [Hint: Need a special gift for Dad? Why not a weekend getaway for golf in the mountains?] Find your favorite Big Sky adventure in this summer action video. Bozeman Summer Adventure - Your Montana Starts Here! With so many adventure opportunities, options are limitless. Check out the video in the link. It is hiking season! Beehive Basin Trail in Big Sky has often been listed as one of the best hikes in the world. Approximately 6 miles round trip, can be done at your own pace and timeframe. Great spot for a picnic lunch at the top! Check out The 10 Best Hikes in Bozeman: Hit the trail! Cool video of Gallatin River rafting at House Rock this week posted by Explore Big Sky! With the extensive snowpack this winter, the rivers will be running fast and full for quite a while. Book your river expedition soon! Looking to get out of the city this summer? - Now new direct flights to Bozeman from 15 cities in the US with worldwide connections - Check out the Bozeman Yellowstone International Airport route map. Recently ranked by Money Magazine as the #5 top airport in the US, it is an easy commute to all of our regional attractions. Hop a direct flight to Bozeman, and launch your explorations from there! We are happy to announce effective June 1st, Stay Montana offices in Big Sky will be located in Big Sky Town Center - 33 Lone Peak Drive, Suite #104. We are very excited to have this new location and we will begin work on the offices next week. We are shooting for a grand opening the first week of June and look forward to greeting you when you visit this summer. Just look for the Stay Montana location marker logo. We are SO excited for summer! Hope to see you here soon! [04.27.18] As we recently celebrated the close of an epic winter snow sports season, so we also celebrate the energy of spring and the anticipation of summer to come. The bears are emerging from their dens with cubs in tow, and young bison ‘red dogs’ are now grazing alongside their mothers. Birds are singing in the trees, and the snow pack has begun its seasonal melt into our blue ribbon streams with each day of warming spring sun. Congratulations to all southwest Montana high school grads as well! Book Dad a week in Montana for Father’s Day - June 17 - he will love you for it! Book your Stay Montana lodging now so not to miss the fun events happening this summer! 10 - Escape, Solitude, Relaxation: Climb a mountain, sit by a stream, relax in a day spa, stand outside anywhere in our amazing region and marvel at just how big the sky really is!! Plan a Stay Montana escape today and discover that dreams can truly be enjoyed while you are awake! Here in Big Sky country, we have been blessed with an abundance of fresh powder to usher in Spring 2018. [04.02.18] 9 more inches this morning, on top of 20” received over the last 7 days. April skiing is going to be awesome this year! With near record snowpack, skiing will be great through the end of the season. 20 more days to go at Big Sky Resort with closing day set for April 22 - an extra week this year! There are still a few vacation properties available, so book now and treat yourself to some spring snow fun. Closing weekend is always a blast, and Pond Skim on April 21 is not to be missed! Yellowstone National Park is now open for cycle days only through April 19, with the West Yellowstone entrance scheduled for warm season road travel on April 20. It’s never too early to start planning your next great mountain vacation! Early ski pass sales are happening now for the 2018/2019 winter season, with lots of great new options for Big Sky season-passes as well as an introduction of the Ikon Pass. Big Sky Resort is now one of 26 destination resorts available with this pass. Book your next winter vacation soon! It’s going to be great. And summer is just around the corner…. Plan your dates now, and look for our Summer Travel Planning Guide coming soon! Still time to fit in a Spring Break adventure to Big Sky Montana! So much to do during March! [03.04.18] Mountain snow conditions are great this year - record snowfalls have blessed us again - so excellent base depths will carry us well into April with continued great snow sports activities. There are numerous events happening for everyone in the crowd to enjoy. March Snow Sports - Don’t miss the action! Run To The Pub - 3/17 - Runner’s World voted this event as #2 ‘Best in the US’ half marathon in the country. St. Patrick’s Day 10k and Half Marathon, and all finishers are entered to win a trip to Dublin, Ireland. Breakfast in Bozeman: Great days start with a great breakfast, so be sure to enjoy some of our favorites! Feed Cafe, Jam!, Wild Crumb, Nova Cafe, Main Street Over Easy, Mama Mac’s. Local Big Sky Lunch Tip: For a nice change of pace, try the Peaks lunch buffet at Big Sky Resort. Service from 11-2, it includes a full soup, salad, and multi hot entree buffet plus carving stations - great selections, healthy options, and reasonable price. Have a relaxing midday dining experience or linger into apres with full bar service for a leisure slope side experience. Big Sky Resort has extended the ski season to April 22, with Pond Skim on April 21 this year. Lodging options are still available, so come see us this spring! Happy February! Happy Groundhog Day! Happy Snow Sports Heaven! While Punxsutawney Phil confirmed 6 more weeks of winter, those of us in Big Sky country already knew this to be a definitive prediction. We are well underway with a great winter season. Virtually all terrain, lifts, and trails are open at Big Sky Resort and Bridger Bowl. Ski conditions are great, and weather forecasts show continued snow through the next week to enhance an already well-established base. If you don’t already have a winter trip planned to visit Southwest Montana, there is still time to book - and February is the time to be here! With great on-snow experiences and terrific special events, we celebrate winter in the best way possible. We hope to see you soon! This weekend at Big Sky Resort - Dummy Jump 2018 - enjoy the creative, crafty, crazy event and then get some ski runs in before the big game on Sunday. Smokin’ Aces Tour - Big Sky Resort Feb 10 - this tour brings the best skier and snowboarder slope style tricks to our Northern Rockies destination. BSF & USASA Slopestyle/Rail Jam - Big Sky Resort Feb 17-18 - Bridger Ski Foundation and the USASA are at Big Sky Resort for a weekend of action packed ski and snowboard competition. Fun to watch (or compete!). Also enjoy regular live music performances throughout the resort along with Warren Miller Performing Arts Center venues. Pick up tickets to a live stage production of Dirty Dancing, Feb 13, presented by Broadway in Bozeman at the Brick Breeden Fieldhouse, Enjoy Voices of Broadway - The Phat Pack - three professional Broadway actors/singers portraying a variety of roles at the Ellen Theatre on Feb 16. Your options for apres entertainment are endless…. From your Stay Montana team - See you on the slopes! lonemountainescapes.com and montanavacation.com are pleased to announce our merger and new name of Stay Montana! 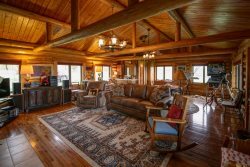 You will find all of our great vacation rental properties and regional information combined and available at staymontana.com. Your quintessential Montana experience starts here! The holidays are here! Amid the hustle and bustle of travel, cooking, shopping, and get-togethers with family and friends – here are a few ideas to create new memories and make the season extra special this year. From our family to yours, we wish you a joyous holiday season, and new year filled with peace, good health, hope, and happiness! Our favorites! Places & Events not to miss when planning a trip to Big Sky country! [11.12.17] Thanksgiving is next week, a perfect time to be with friends and family, share memories, and while you have the group together – finalize plans for your winter vacation! Making arrangements now will ensure you get the best locations and accommodations, so don’t wait! Additionally, experiencing the culture and cuisine is one of the best parts of travel. Be sure to include plans to enjoy some of our favorite spots while you are here. Gallatin Riverhouse Grill - gallatinriverhousegrill.com – Amazing BBQ in an old west saloon setting on the Gallatin River. This family friendly restaurant is fun, affordable, and open seven days a week. Get there early, if you don’t want to wait…or take out works too if feeding a hungry crowd. Olive B’s Big Sky Bistro - olivebsbigsky.com – Looking for a Montana fine dining experience – look no further! Chef Warren “Bibber” and Jennie Bibbins treat us to a fantastic meal every time we visit. Growing up in New England, their love for fresh seafood shows in many of their delectable entrees. The chefs’ specials are always delightful, particularly the halibut. Our favorite dish is the Rocky Mountain Elk! Ousel & Spur Pizza Co. - ouselandspurpizza.com – Great hand tossed pizzas with fresh sauces and ingredients from Montana farms. They also have a nice selection of Italian pasta dishes and their spaghetti & meatballs are a staff favorite. Lotus Pad - lotuspadbigsky.com – If you like Thai, this is your place in Big Sky. Fun, fresh, fusion of flavors using organic ingredients whenever possible, this restaurant has been a Big Sky favorite for years. Buck’s T4 - buckst4.com – For some authentic Montanan cuisine, this place has been doing it right for more than 50 years. Starting as a roadhouse lodge, Buck’s has built a reputation for great dining in a rustic Montana setting. Chef & Co-Owner Chuck Schommer has refined the Big Sky dining experience and is an established leader in the community. The culinary creations here are complemented by an extensive wine list. If you’ve never tried wild game, this is the place to do it! ...cast iron seared red deer with duck bacon risotto and Montana wild berry reduction…yum! And while it will be very difficult to do….always save room for dessert! If your stay expands beyond 5 nights, you might also want to try: Horn & Cantle, By Word of Mouth, Peaks, Andiamo Italian Grille, Moonlight Tavern, and Everett’s 8800. For hearty on-the-go breakfast sandwiches and pastries: Blue Moon Bakery and Hungry Moose Market. Montana Dinner Yurt - bigskyyurt.com – It was a long desire of mine to ride a snowcat. To fall asleep mountainside watching their lights glow on the trails as they create pristine skiing conditions for the next day, to their unique hum in the morning as they return to base after a full night’s work – I was always mesmerized by the dreams of what it must be like to ride a snowcat. Thus, I originally booked a reservation with the Montana Dinner Yurt – just so I could ride a snowcat! However, I was pleasantly surprised by the amazing food in a really cool yurt atmosphere in a hidden backcountry location. Don’t miss this fun dinner adventure - and you too can check ‘snowcat ride’ off your bucket list! Lone Mountain Ranch Sleigh Ride Dinner - lonemountainranch.com/sleigh-ride-dinner This dining experience is magical! Riding a horse drawn sleigh through the snow-covered woods to a candlelit cabin for dinner is something right out of a movie. And it is something you will talk about for years to come. BTW, the food is great, too. The Carabiner Lounge – ski right to the Carabiner, park your skis outside the door, and enjoy an after-ski beverage in a beautiful setting. If you prefer to express your creativity and showcase your culinary skills hosting dinners in the comfort of your vacation home, these two grocery shops can help you take the hassle out of sourcing ingredients and stocking the kitchen. Hungry Moose Market – hungrymoose.com – A great little market in Big Sky Town Center that also provides online shopping and delivery to your vacation property for stocking the kitchen before you arrive. This market has nearly everything you will need to make your favorite culinary creation! Plus, they have a great wine selection too. Roxy’s Market – the newest grocery store addition to Big Sky, Roxy’s offers a wide selection of items to feed a hungry crowd. For an extra special vacation experience, be sure to book your vacation home lodging during these favorite events. Put these dates on your calendar now! Nov 24 – Bridger Bowl Planned Opening Day – early this year due to snowfall! So you don’t ski? Now what!! Do not fret! Pack your bags and come enjoy a great winter vacation experience! There is plenty to do here that does not involve strapping boards to your feet and flying downhill. So don’t miss out on all the other family or group fun just because you don’t ski or snowboard! Here are some fun things to do – solo or as a group – while you are in Big Sky country. Yellowstone Snowcoach & Snowmobile tours – https://www.nps.gov/yell/planyourvisit/snowmobiles-snowcoaches.htm - This is a great way to experience Yellowstone National Park to see wildlife, Old Faithful, and the beautiful geysers in YNP. Museum of the Rockies - museumoftherockies.org – treat yourself to a fun day of exploration, and a great gift shop for the little scientist in all of us. Respite – perhaps life has been stressful, and you might enjoy a day to yourself to sit by the fire and lose yourself in that novel you’ve been wanting to read…. Enjoy! And, if you feel the lure of the mountain calling, and you decide to try skiing or boarding for the first time….we recommend renting gear and hiring a pro for lessons. It is worth it - trust us! The new gear styles and methods of teaching have improved greatly since we were kids. It is much easier than you might think! And there are plenty of easy/green trails for learning. Have fun out there! Saffron Table - saffrontable.com/#welcome - Tasty dishes from the diverse cuisine of India and south Asia are presented in a delightful bistro atmosphere. You will love the biryani, curries, and the locally sourced chicken, fish, and lamb dishes. Plonk - plonkwine.com - an eclectic wine bar with great food and delicious specialty cocktails. Plonk is an excellent location for Happy Hour, dinner, or dessert. Start with the cheeseboard or ploughman's platter, select your favorite beverage, and see where the evening leads....you will not be disappointed! South 9th Bistro - south9thbistro.com - Loved by local foodies, South 9th Bistro offers great food in a quaint relaxed environment. Montana Ale Works - montanaaleworks.com - This local favorite has a great bar with 40+ draft beers, great food, and a great vibe! Open Range - openrangemt.com - an upscale comfortable environment with cast iron seared specialties. When you're hungry for a steak - this is the place! 14 North - 14northrestaurant.com - upscale pub with delicious small plates for Happy Hour, and seafood, pasta, burgers, and vegetarian dishes to please the entire crowd. My winter favorite is the butternut squash tortellini. Good kids menu with a steak option. Urban Kitchen - urbankitchenbozeman.com - experienced chefs recently opened this neighborhood restaurant, and it has gone straight to the top of the charts of places to eat in Bozeman. Fresh ingredients, inspired twists to traditional favorites, and they customize dishes to accommodate food allergies and preferences with ease. Service is superb. UK is definitely a home run dinner choice. Hiking is somewhat of a religion in Bozeman, Montana. Some do it for the exercise, others to find a place of solitude, many to grab the perfect instragram worthy photo, and some because well, that’s just what you do if you’re around this kind of beauty for long enough. Whatever reason you love the outdoors we put together the short list of top hikes you can find near Bozeman. Shared by everyone and their dog The “M” Trail in Bozeman is a local favorite. Carved out by Montana State University Students years ago the “M” marks the universities’ presence in the picturesque Bridger Canyon. Views and vistas from every step make this one of the most beautiful hikes in Southwest Montana. Short enough to do before or after work but long enough to feel like you accomplished something, the 3 mile trek will bring you instagram worthy moments. Located south of Bozeman next to the beautiful hyalite reservoir this is Montana at its finest. Waterfalls, towering pines, and mammoth rock formations bring beauty in every step. The star of the show is located 10.5 miles up Hyalite Canyon; here you will find the glistening Hyalite Reservoir. A well maintained trail throughout is perfect for beginner, novice or advanced hikers. Coffee is art and science. Or maybe, a science of the arts. From the perfect ratio of a pour over to a depth of knowledge in roasting beans coffee is blowing up in Bozeman. After all, who doesn’t have a high appreciation for finely caffeinated works of art? Whether you’re a local or just passing through on a Montana Vacation here are 3 must-try coffee spots in Bozeman, Montana. Inspired by their motto: “Food that feels Good” Sola Café offers up high quality eats and thoughtfully crafted coffee. You can never go wrong with a place that makes pastries and coffees from scratch every morning. This fun location has indoor and outdoor seating and is located on the corner of Kagy and 3rd. Plus, pick up some locally sourced ingredients from the marketplace on your way out the door, perfect for fresh salads or organic meals. Rockford Coffee Roasters is a local favorite that has been around for years. “Carefully sourced and consistently delicious” is part of their DNA and that means you can always expect a great cup of coffee. Make sure you have your cell phone ready for that perfect latte art photo. They have some of the best baristas in town, which means you’ll get a great tasting espresso creation along with a frothy heart on top. Quality espresso produces quality flavors. Cold smoke takes pride in importing coffee from only the highest quality farms worldwide. They offer a wide range of single-origin coffees and custom blended espressos. This place knows coffee. And you can taste it in every cup. Cold Smoke jumped on the scene in 2011 when a couple of Bozeman natives decided to open a “different kind of coffee shop”. What makes Cold Smoke unique is their desire to build community. Its displayed in the architecture and functionality of their spaces. Large seating areas and community tables give way to locals and visitors alike sharing stories of their time in Montana.